Baker freshman JD Woods looks over to the sidelines after scoring a touchdown in the Wildcats' 66-14 win over Graceland on Sept. 16 at Liston Stadium. BALDWIN CITY — When Baker University freshman JD Woods steps on the football field, there are rarely other players who can match his speed. Woods — who transferred to Baker after one season at Missouri Western — loves the feeling of hitting a hole and seeing nothing but green grass in front of him on the way to the end zone, and has been a problem for Heart of America Athletic Conference opponents to slow down this season. The former Lawrence High standout leads the NAIA in touchdowns with 13, and has helped the second-ranked Wildcats to a 6-0 start. Whether it has been at Baker or his four years at Lawrence, individual stats have never been of the utmost importance to Woods. The redshirt-freshman running back is focused on adding on to the Wildcats’ 23-game Heart winning streak, and helping Baker back to the national championship game. While defenders haven’t had much success slowing down Woods, he’s made it a point over the years to take things in stride whenever he’s receiving advice from coaches. Woods’ hot start has been partially sparked by a coach who he didn’t end up playing for. 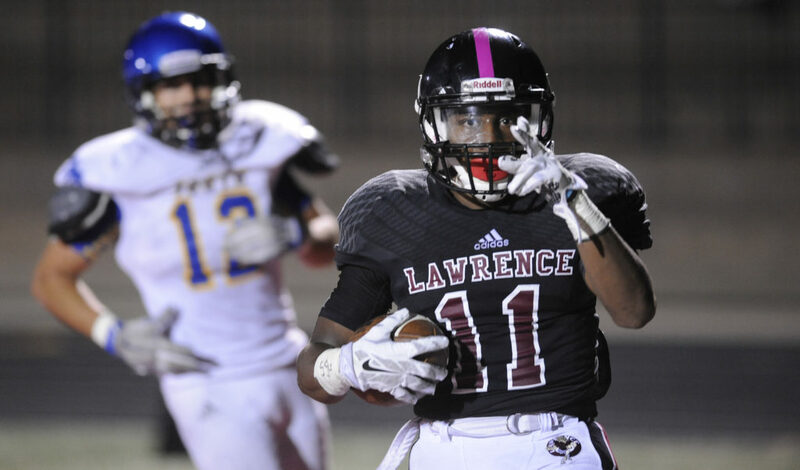 After Woods made up his mind that he wanted to leave Missouri Western State, he narrowed down his college choices to Baker and Grand View (Iowa). Although his roommate from Missouri Western, Ben Ferkin, decided on transferring to Grand View, Woods was told that he would be lower on the Vikings depth chart than he would be at Baker. In Baker’s 48-41 win over Grand View in Week Two, Woods played with a chip on his shoulder as he rushed for 200 yards and three touchdowns — which earned him Heart Offensive Player of the Week honors. Woods’ 97-yard touchdown run in the fourth quarter was the longest of his career by 1 yard and also broke the Baker record of 96 yards that was previously held Jim Paramore and John Reeves. 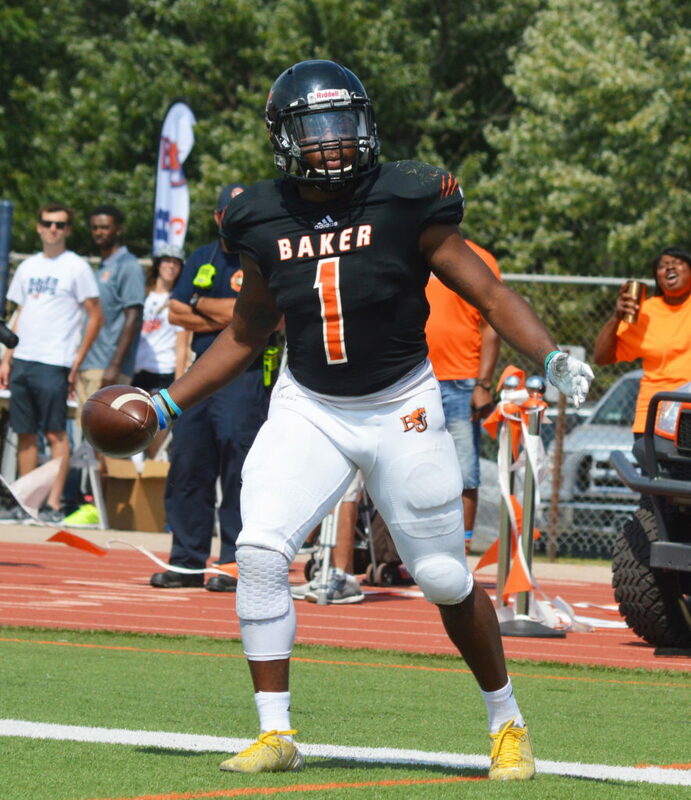 While Woods burst on to the scene in the win over the Vikings, it ended up being the final game of the 2017 campaign for Baker All-American receiver Cornell Brown. The Baldwin High alumnus had 1,418 rushing yards, 871 receiving yards and 31 total touchdowns last year, but is out for the remainder of the season with a thumb injury. Brown — who was granted a medical redshirt — was moved out to play more in the slot with Woods being the feature back in Baker’s high-octane offense. Although Brown is bummed that he’s played his final game with quarterback Logan Brettell, wideout Clarence Clark and the other Baker seniors, he’s still doing all he can to make the Wildcats better. The Baldwin City native is trying to get an early start on his coaching career and is continuing to take players like Woods and the other 65 freshmen on the Wildcats roster under his wing. Although Brown and Woods never played against each in high school, they’ve been close friends over the years. Once Woods reached out to Baker coach Mike Grossner about transferring, Brown did his fair share in convincing the former LHS star to come to BU. With Brown being a senior, Woods was high on Grossner’s priority list to add to the Wildcats’ backfield depth. Lawrence has long been a hot bed for Baker football players with the deep roots that BU defensive coordinator and former LHS and University of Kansas star Jason Thoren has throughout the city. Woods has kept opposing defenses honest so that they can’t key in on Clark and emerging freshmen receivers Nate Pauly and Nick Snider. As the reigning National Player of the Year, Brettell has averaged more than 300 passing yards per game with 21 touchdowns to just three interceptions. While Woods continues to learn the offense, Grossner would like to use him more in the passing game with some screen plays. The more Woods has become comfortable with the Baker offense, the more he’s liked it. The Wildcats will enter their bye week with the toughest stretch of their schedule behind them, as they have defeated four top-25 teams. Baker will play host to MidAmerica Nazarene on Oct. 14 at Liston Stadium.